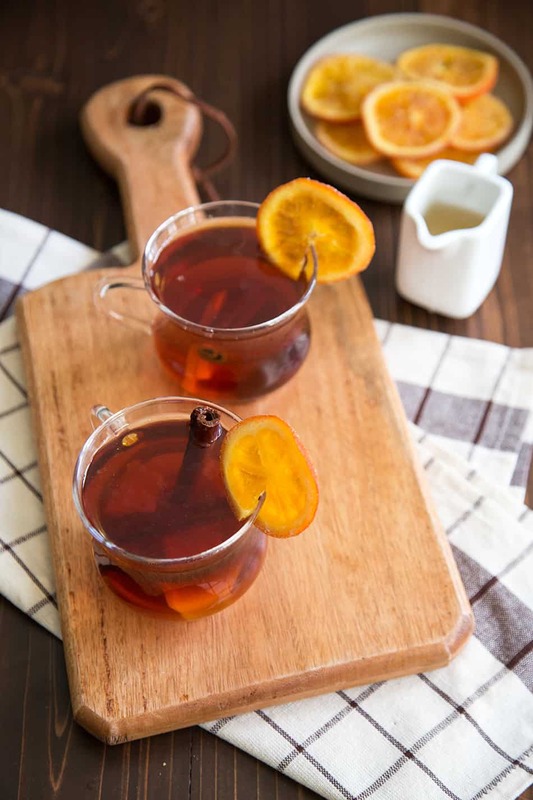 This orange spiced tea is steeped with orange peel, cinnamon, and ginger. It’s the perfect tea to cozy up with this autumn season! A little over two weeks until wedding day. All the big decisions have already been made and taken care of. We’ve got our first dance song, cake cutting song, and every other formality song needed. The menu is set and the desserts have been ordered. All that’s left are the fun little details and parties. I AM SO EXCITED. I’m still running off of last weekend’s high. I had quite the three day adventure in San Diego with some of my best friends celebrating my bachelorette weekend. It wasn’t your typical wild, crazy, boozy bachelorette party. It was quite the opposite. It was calm, tame, and we made it back to the Airbnb every night before midnight- but I had so much fun!! My MOH planned THE perfect weekend. Tiki bars, all day spa day!, lots of food, and catching up with loved ones. That’s exactly what makes me happy. So much laughter, so many inside jokes, and so much pasta. I had such a relaxing weekend. I feel super fortunate to have my friends. All the ladies (and 2 gentlemen) that celebrated the weekend with me have been my friends for 15+ (some even 20+) years. I’ve known them since childhood and it’s insane how we’ve managed to stay in touch and remain in each other’s lives despite time and distance. The weekend’s nonstop chatter did a number on my throat. 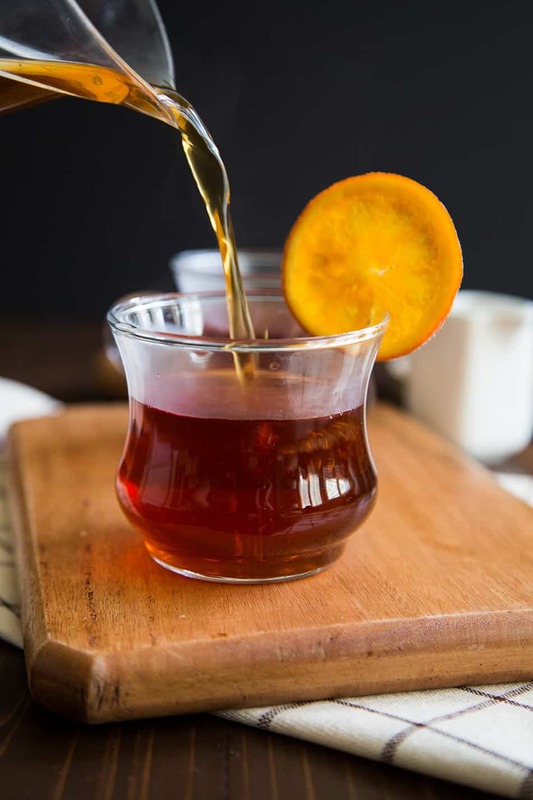 This orange spiced tea is just what I need to soothe Monday blues and mini vacation withdrawals. This tea is super simple to make. It tastes great warm and even better chilled (especially during this mini October heatwave we’re about to have). I took standard black tea bags and steeped them with orange peel, cinnamon sticks, and sliced ginger. It’s a little sweet, a little spicy, and very flavorful. 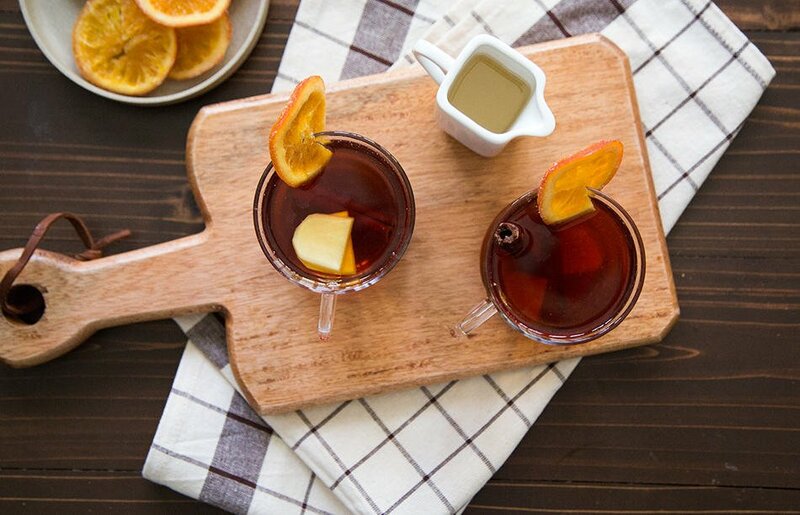 I intensified the flavor with a delicious spiced simple syrup. Asides from sweetening this tea, it’s lovely in coffee, oatmeal, and smoothies. 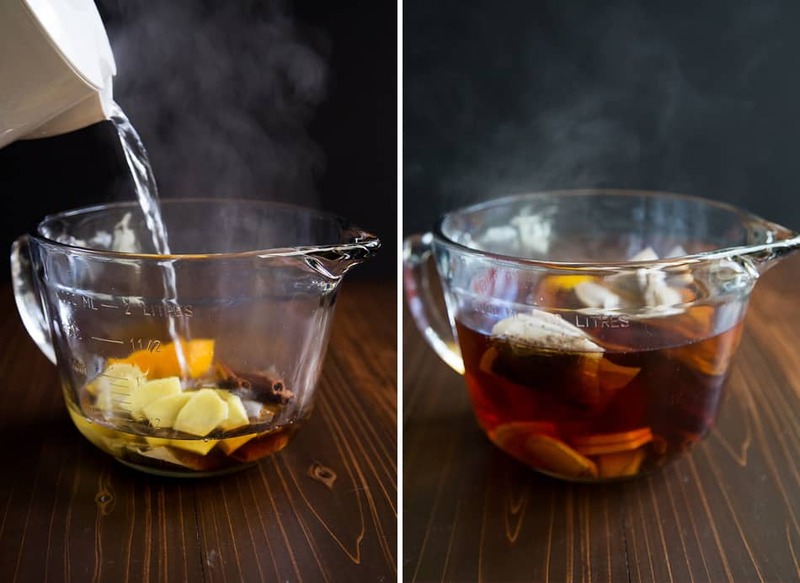 Stay tuned… I’ll be using this tea to make spiced hot toddy! 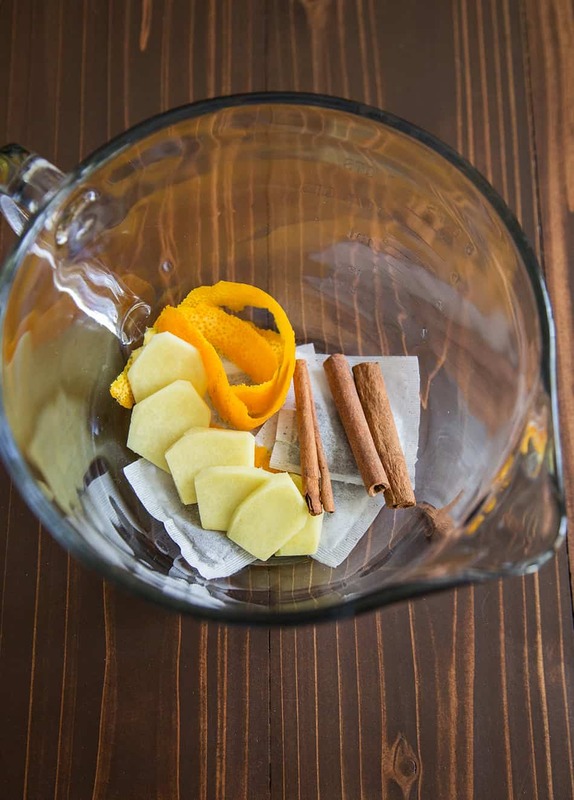 In a large heat proof bowl, add black tea bags, orange peel, cinnamon sticks, and sliced ginger. Pour just boiled water over spices. Allow to steep for 6 minutes. Strain out tea bags, orange peel, cinnamon, and sliced ginger. Serve warm or chilled. Add spiced simple syrup according to your sweetness preferences. Once the chilly weather rolls around, we go through a lot of tea. This looks like a lovely new one to try! Best wishes on your upcoming wedding. How exciting! And your tea…delicious. 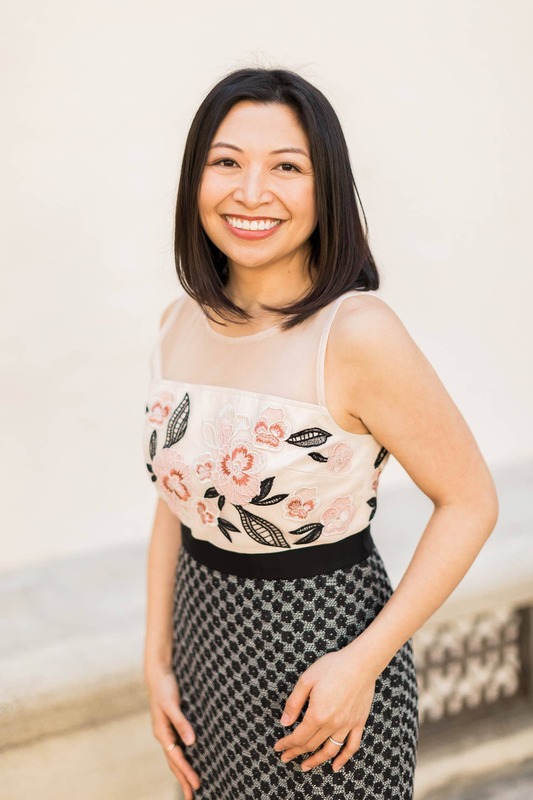 Congratulations on your upcoming wedding, MA! I need this tea stat to soothe my very own sore throat. I’d love to try this out chilled and warm. I love that the extras are steamed with it. It’s been so hot in LA and the iced version of this tea is giving me life! Aaahhh, only 2 weeks till the big day?! Such an exciting (stressful) time. What a perfect drink to try and relax to while planning little last minute details. Thanks! Yes, I can’t believe it’s almost time!! This sounds like it would be perfect for a cold day! Oh my goodness, this sounds fantastic! I would love to curl up with a glass of this this fall! I am so excited for you!! And the bachelorette get away sounds just perfect. And this tea is just perfect for the oncoming colder nights. These are so Instagrammable and adorable! Definitely looks yummi! 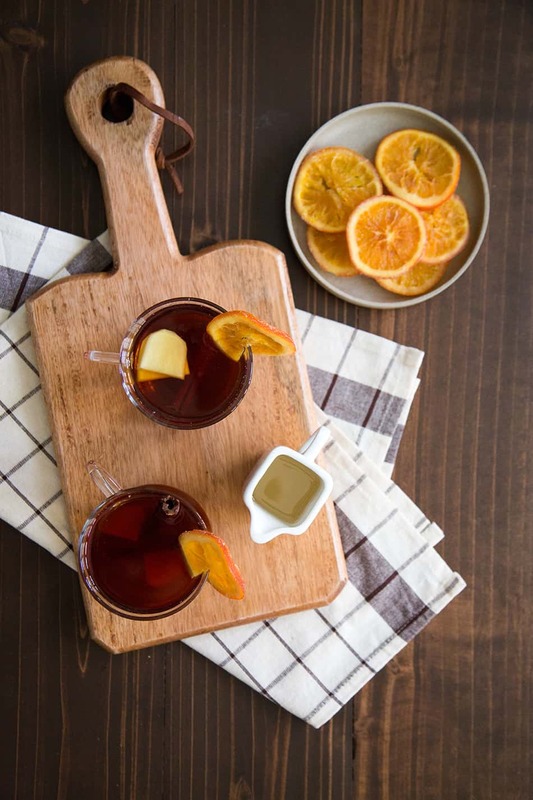 I love your orange spiced tea recipe cuz it contains healthy ingredients! Thanks a lot for sharing!